America’s First Choice Home Club distinguishes itself by providing additional lifestyle benefits included in their home warranty plans. Earn retail benefits while shopping online, Resturant.com gift cards redeemable at 1,000s of locations across the country and enjoy the peace of mind that comes with the Emergency Alert Network. All of this on top of Better Business Bureau membership, an extensive contractor network and one of the industry’s highest claim limits. $7,500 annual claim limit - higher than most other companies. Additional benefits such as the Retail Rebate & Restaurant.com programs. Contractor appointments made within 8 hours. No home inspection is needed before joining. They use local service contractors already established in their communities. Unique plan benefits such as the Emergency Alert Network. They commit to setting appointments within 8 hours. High annual claim limits - no need to worry if multiple repairs are needed in a single year. Limited information about terms and conditions and limits of liability on their website. No information is given with regard to maintenance requirements and records. America’s First Choice Home Club is loud and proud with the prominent display of it’s ‘Better Business Bureau’ membership and ‘B’ rating. 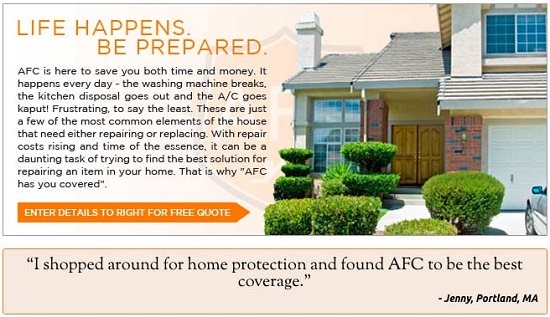 When you visit the Better Business Bureau you can read user reviews and view the comments made by AFC Home Club in response. They clearly make every effort to resolve any issues and are happy for potential customers to read about the times that things haven’t quite gone as well as they should. There is also a reviews section on the AFC Home Club website. In order to obtain policy details, terms and conditions, deductibles etc. you have to contact a customer service representative. AFC Home Club has three basic levels of home warranty - Bronze, Silver and Gold. All plans include their Retail Buyers Rebate scheme, the Restaurants.com program and their emergency alert network. A basic Bronze plan covers only your water heater, air conditioning and heating systems but this would be a great option for landlords whose tenants have their own appliances. Silver is a more appliance based plan which includes the washer and dryer, oven, range, dishwasher etc. The America’s First Choice Home Buyers Club Gold plan is the most comprehensive. It includes not only the basic systems and appliances from the Bronze and Silver plans but also the telephone, electrical and plumbing systems. Additional items such as septic tanks can be added to any plan for an additional premium. Full terms and conditions are not explicitly laid out on the website but information about some areas can be found in the FAQ section. For example - there is a standard $60 service fee, pre-existing conditions are not covered and there is a plan claims limit of $7,500 per year. In order to obtain a full policy with terms and conditions laid out, you must contact their customer service. There are three main plans on offer from AFC, each one improving a little on the last. ‘Bronze’: coverage for your water heater, air conditioning and heating systems. Access to, as will all AFC customers, emergency alert network, retail buyers rebate and various gift cards. ‘Silver’: additional coverage particularly for appliances; clothes washer/dryer, refrigerator, oven, range, stove, dishwasher, garbage disposal and garage door opener. ‘Gold’ plan goes one further, by combining everything from the other two plans and adding electrical system coverage, gas, plumbing, ductwork and telephone wiring. Additional Coverage Options are available for extra fees. Pools, spas, pumps, vacuums, freezers, septic systems and specialized duplex, triplex, quadplex protection. Pricing is entirely quote-based. Factors that will affect the price of your quote include house size, property type and state. Service charges are normally around $60 per call-out, but again vary by state. AFC has a well thought out website with a great deal of information about the company. Warranty holders can submit claims by telephone 24/7 or by using the online claim form. Whichever way you submit your claim, AFC makes a commitment to having an authorized service center contact you within 8 hours, during normal business hours, and arrange for a mutually convenient appointment time. Many of the customer reviews on their site, and on other sites, mention the fast and efficient service received. The AFC Home Club website also has an FAQ section and reviews from existing customers. An extensive network of local, well established contractors is available to speedily meet customer needs. Committed to customer satisfaction, AFC Home Club uses trusted contractors that are often already known to the warranty holder. A number of reviews from around the web, mention how happy customers have been to open the door and to find themselves face-to-face with a local contractor they have used previously - before taking out an AFC warranty. America’s First Choice Home Club is the only home warranty company we looked at that did not require you to provide personal details to obtain a quote. With their ‘Better Business Bureau’ accreditation, the retail benefits program, emergency alert network and Restaurant.com gift card program they offer many additional benefits not found with other home warranty companies. Further peace of mind can be found in the knowledge that positive customer reviews can be found on multiple websites and America’s First Choice Home Club take the time to openly address customer dissatisfaction detailed on the Better Business Bureau site. America’s First Choice Home Club was founded by a group of experienced home warranty professionals who wanted to provide a better kind of service and ensure their customers never had to worry about the costs of home repairs. A Better Business Bureau accredited business since Feb 2015, AFC Home Club have made a commitment to put their customers’ experiences at the top of their list of priorities.